The Planner for your Unorganized Learner! 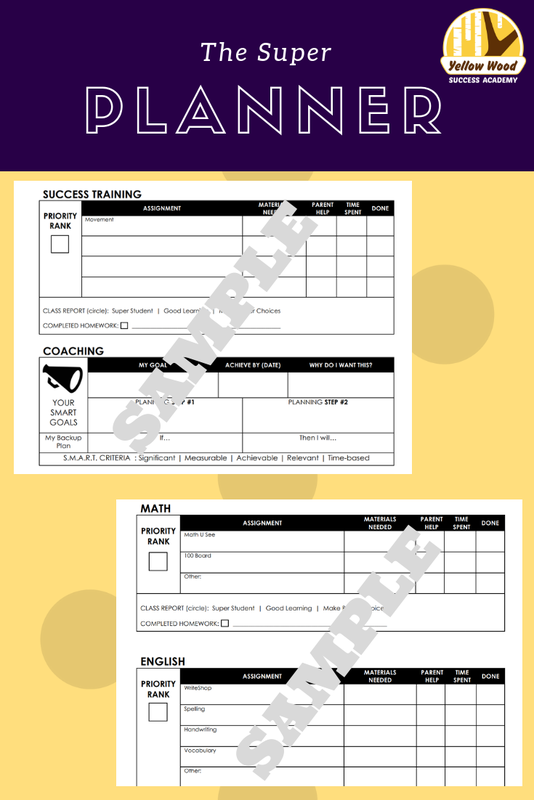 Looking for the perfect student planner for your unorganized learner? We’ve got just the thing for you! If you’ve followed us for a while, you probably know that we have a cottage school at Yellow Wood in Lexington, KY. Over the years we’ve tried out quite a few different ways to assign homeschool work for our students. Many of our students struggle with organization, task initiation, time management… sound like executive functioning weakness? So, we have found that just writing down home assignments, or expecting students to write them down and remember all the pieces, is a bit unrealistic. We strive for our students to feel confident and successful in their home assignments, while being challenged in their work. This can be difficult to accomplish if a student feels overwhelmed or confused before they’ve even started the assignment! You can use it to help your school student organize their homework, or for your homeschooled student to organize the day’s plan. It is versatile and breaks down the information into bite sized chunks so the burn out over reading homework won’t take over! 1. Set goals like a pro! One aspect we didn’t want to miss on our planner is the idea of goal planning. As an adult I’ve learned a lot in the past couple years about the importance of setting goals, whether you reach all of them or not. Many times setting goals is very overwhelming for a student, especially if they struggle with executive functioning. We break it down and ask students to set and monitor goals throughout the week. They don’t have to be big goals. Small goals for the day, like “I’ll work for an hour before taking a break”, “I’ll try out the pomodoro method”, “I’ll do math first to get it over with”, or even “I’ll practice riding my scooter for 15 minutes as a break” - They don’t have to lofty. In fact, we remind students that these goals should be S.M.A.R.T! Goals should be specific, measurable, attainable, realistic, and timely. Keeping these things in mind will help students find a bite sized goal to start with, and then begin to dream big and meet those goals! Goal planning is an extremely important skill for adulthood, college planning, and career goals. Knowing what you want to accomplish and how to get there will fuel your students to reach the goals they make. 2. Where did that book go? Another aspect that may overwhelm students when looking at homework is trying to figure out what they need to complete the assignment. “Where did I put that?”, “What worksheet? ?”, “oh, I need glue and scissors… where did I put those?”... the list goes on. By listing out next to the assignment exactly what is needed to complete the assignment, students can grab what they need an get to the real work! 3. This is taking FOREVER! We also have a slot for noting how long an assignment took. Students who do not have a good sense of time will feel like they’ve worked on something FOREVER when in fact it was maybe 10 minutes. Or, they are anxious to make it just right, so they’ll focus all their time on one task and get behind in others. By tracking their time, students, parents, and teachers can all stay on the same page with how long something took so that they can make adjustments and help the student spend an appropriate amount of time on each task. It’ll also help students begin to take ownership of their time and build up an internal sense of time. 4. Mooooom! I Need Help! Another important feature of our planner is the section for “parent help”. Here, students can mark of they needed help, so that rather than getting stuck and waiting on mom or dad to be free to help, they can move onto the next task. When mom or dad become free, than can quickly glance and see what needs to be worked on together. See how that can help? 5. Mark that homework complete! It is incredibly satisfying to mark something completed. Students or parents can use this section, depending on the maturity of the student. We often ask our parents to check over homework and mark it completed themselves. If you are interested in getting this planner, you can find it in our membership program, Path to Success. This membership site opens again March 15th. There you’ll find resources like the Super Planner, my full course on Reflex Integration, midline integration, working memory exercises, and So. Much. More. Snag the pre-launch price and learn more about the program below!